Oiling the grill before adding the Halloumi stops it from sticking; grill it on the coolest part of the barbecue so that it doesn’t burn. Heat the barbecue. Slice the large tomatoes and halve the cherry tomatoes; reserve any juices that are released. Season well. Slice the Halloumi into fingers. Oil the grill and cook the cheese on both sides until well marked. Whisk the olive oil and vinegar together with some sea salt and pepper, then whisk in any tomato juices. 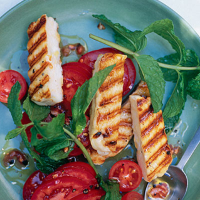 Arrange the tomatoes and Halloumi on a large serving platter. Scatter with mint and drizzle with the dressing. A zingy blend of shiraz and malbec, served chilled if you like, is gulpably good with grilled Halloumi and its hint of mint. This recipe was first published in August 2008.